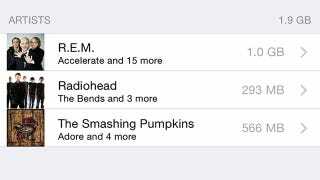 iOS 8 brought with it an avalanche of new features and options, but one that you might not have noticed yet is the ability to break down how much storage space each album and artist is using up. If you need to trim down a bloated music library then this feature can help you spot the worst offenders when it comes to hogging precious room on your device. Being able to see how much storage space your music is using up is an option that's been around for a while, but now you can get more details. From the Settings app pick General, Usage and Manage Storage. You can then see a list of artists together with the amount of storage space they're responsible for on your device. You can keep on tapping through to look at individual albums and even tracks. Tap Edit if you want to delete anything from your device or swipe to the left to do the same job. If you're desperately trying to make room for a new movie or app download then saying a temporary goodbye to some of your least favorite bands and singers is one way of doing it.